The fact is.....Motorcycle riders and racers crash frequently on pavement. 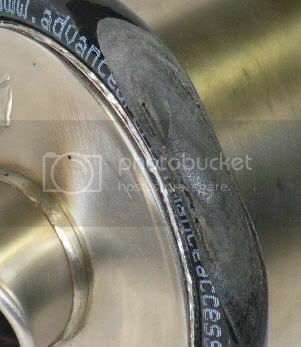 Exhaust manufacturers DO NOT want you to know about this product! Why??? Because they want you to destroy your muffler so they can sell you another at $500 a pop! Factory race teams exhaust systems are given to them for FREE but you and I have to pay for ours ....... why not protect your investment? This product has been used and thourally crash tested by Monster Kawasaki Supermoto team. This Muffler Slider was low sided two times at 65+ on a Yamaha R6. Flexible Universal design fits all shape and size Mufflers. 3 Muffler Slider sizes available. Half Muffler Slider Fit - Full sized motorcycles with tight inside clearance. 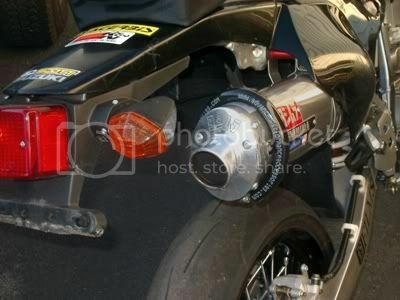 Full Muffler Slider Fits - Full sized motorcycles with 3/4 inch or more inside clearance. The Full Muffler Slider is a more versital choice allowing you to flip it over after damadging one side.